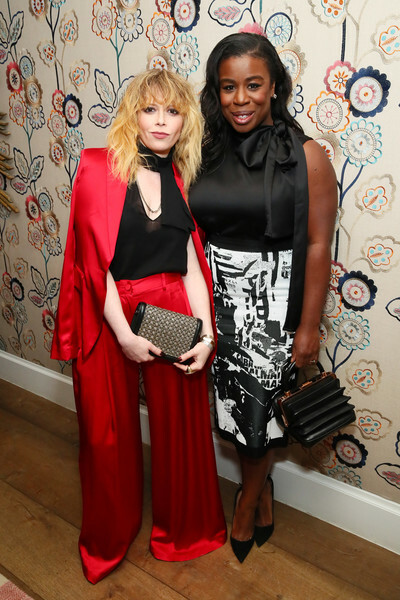 Natasha Lyonne (L) and Uzo Aduba attend the InStyle Badass Women Dinner Hosted By Taraji P. Henson And Laura Brown on February 02, 2019 in New York City. Uzo Aduba accessorized with a unique accordion purse. Natasha Lyonne sported an oversized red satin pantsuit at the InStyle Badass Women dinner. Natasha Lyonne teamed her outfit with a printed clutch. Uzo Aduba was demure in a black bow-neck top. Uzo Aduba added a dose of edge with a graphic-print pencil skirt by Balmain.